To be honest I have not loved everything I’ve read by Cherie Priest, but when it comes to horror, she sure knows how to write a creepy and atmospheric novel. In fact, her book The Family Plot is one of my favorite haunted house stories, so while I know that not all her books will strike my fancy, I’m still excited to keep reading her work. The Toll sounds like one I’ll really like. Can you say creepy? 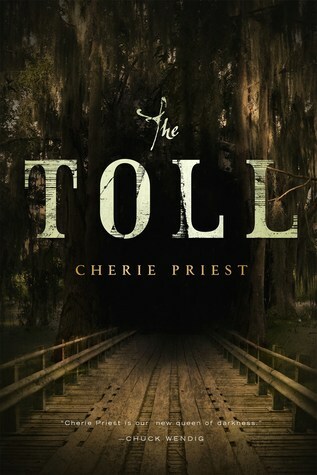 “From Cherie Priest, the author of The Family Plot and Maplecroft, comes The Toll, a tense, dark, and scary treat for modern fans of the traditionally strange and macabre. Oooh that sounds creepy! I likey! Lol! Yeah, I like her horror more than her steampunk series I tried ages ago. I want this. That is all. I loved Maplecroft and The Family Plot and think neither got the attention they deserved. I wondered when Priest was releasing something new. Now I know and I’m all in! Maplecroft was a bizarre book, but a part of that was probably the subject and the Lovecraftian themes. I LOVED The Family Plot though. One of my favorite haunted house stories ever. Oh cool, new Tor catalog? 😉 This sounds pretty creepy, and I love the cover! It was in the latest Tor catalog, but I think they might have added it in later, because I didn’t remember seeing it before! I caught the cover on goodreads. That does sound creepy. Great pick. I’m with you there. She’s hit or miss but when she’s good, she’s REALLY good. I have not yet read any Cherie Priest. This one sounds pretty interesting. I know, soooo long to wait! Ooh! The blurb doesn’t give you much but I’m still intrigued. It’s not often I come across haunted bridges in books!